Day 25: I heard a national weather forecaster today say "Scranton, Pennsylvania has the worst weather in the country." Thank you, Sir, for the very cheery news. We don't live in Scranton, but it's not too far from us either. I also recently heard that a magazine has named the city of Cleveland (my home base) "the worst place to live in." There are even websites dedicated to detailing why some cities and even neighborhoods are the worst places in America in which to live. So much negativity in the world can make us feel like we can't make a difference. But the gospel of Jesus Christ teaches us to look for the good. And people who find the good also find power from within and peace that can permeate every other aspect of their lives. My Mom sent me a link to the "One Million Pillowcase Challenge". 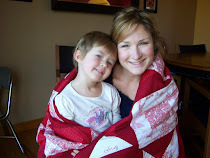 It's a charity that is asking people to make pillowcases for children who are battling cancer. I wanted to make some, but found that none of the quilt shops in our area are participating. So I made one for a friend of mine who is recovering from surgery and will soon undergo her first round of chemo. She is such a good, good woman. And she always sees the good, is always grateful, is always positive that everything happens for our good. But it can be difficult to remember to see the good when you are experiencing such trials. So I made her this pillowcase this morning and added the phrase "Find the good." to help her to remember her own mantra during these trying days. Day 25: Find the Good. great thought to have for any situation. I hope you added your pillowcase to the national count! I can not wait to get started making pillow cases! I love your idea of giving one to a friend. I know I would love that if I were going through that! Thank you for your example. I think you can also donate the pillowcases to a local hospital and it still counts. My LQS is participating so I will definitely be making some. I love your blog, your energy and ideas. I have to say that we lived in Cleveland for four years and love it! For us it was one of the best places to live, I guess all things lie in the eye of the beholder, how great that you keep such a positive attitude about everything around you and keep finding the good! Thanks! some will say life is full of uncertainties but love prefers to say anything is possible. this kind of shift can heal, create peace, and change the world. thank you for doing your part, Jocelyn!